Sridevi’s iconic “Hawa Hawai” from the 1987 blockbuster, Mr. India has been recreated in the forthcoming slice-of-life family film, Tumhari Sulu and the fab video premiered today. 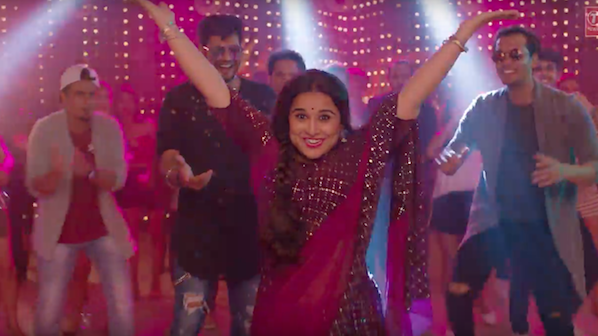 Picturized on stars Vidya Balan aka Sulu, Neha Dhupia and RJ Malishka, the song was recreated by composer Tanishk Bagchi. What is cool is that the song retains Kavita Krishnamurthy’s vocals, as the track is synonymous with her incredible rendition. It certainly looks as if she did, she is fabulous! And stay tuned we have more from our incredible interview with Vidya and a fab chat with director Suresh Triveni coming up soon. Tumhari Sulu releases on November 17th.